It is a place of continual bliss where happiness never cease. Yet, Christ told us in the Bible that the inhabitants of heaven become even more exceedingly happy when one sinner repent. They know that it is not God’s will that any humans should perish but all would receive eternal life. The model prayer of Jesus also states that we should pray that the will of the Father and His kingdom be done on earth as in heaven. It, therefore, means that we on earth should endeavour to share the gospel of Jesus Christ to the unsaved so that they can repent of their sins and accept the Lord as there Saviour. As Christians, most of our efforts are spent preaching to other Christians in the churches. But, Christ did not come to earth to save the righteous but to save sinners. There is no extra joy in heaven among the Godhead, the angels and the other inhabitants for ninety-nine just persons but only for one repentant sinner. Our happiness on earth is contingent on our duty to lead sinners to repentance. We, therefore, need to get our priorities straight. Oh, what a contented and joyous people we will become if only we obey the great commission of Christ to go into all the world and preach the gospel. The world is at our fingertips through the internet, and if we have access to this technology we have no excuse. When we do our part on earth to lead many souls to Christ, the immense joy in heaven will translate into our lives here on earth. I love Luke 15:10. I have memories of witnessing people repenting one their death bed and asking Jesus to be the Lord of their life. (worked in nursing homes as a volunteer pastoral care worker) It still gives me goose bumps. 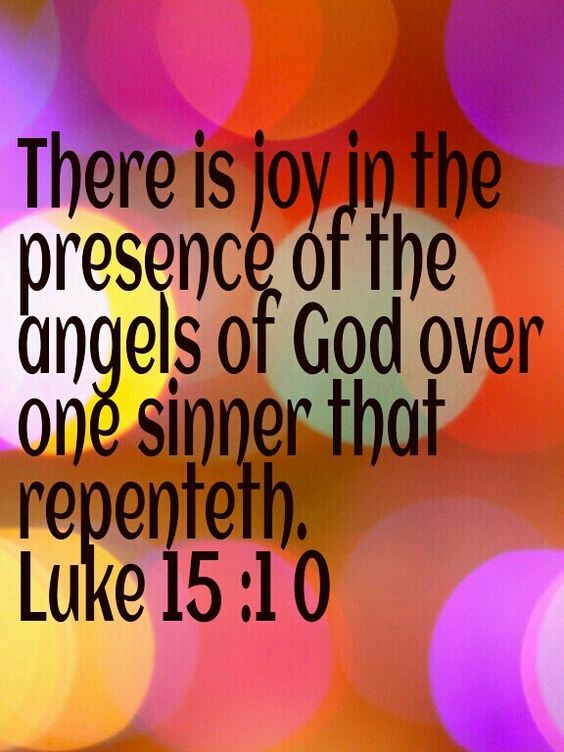 I can imaging the angels rejoicing when someone accepts Jesus as their Lord. It is a unique and wonderful previlidge to witness a precious soul going home to God. Thank you for your input. A lot a Christians don’t understand we are called to bring heaven to earth. When we show unconditional love, tolerance, patience, acceptance, honesty and many more spiritual principles, we are actually bringing heaven to earth. Hi Vernon. You are on target. We need to demonstrate the qualities of Christ. I pray that God will open our eyes to our true purpose. Thanks for your support. Have a blessed week. Beverley, this time you have made our calling profound and yet simple. I have often thought that we spend our “tithe” as Christians too much on supporting a campus which mainly we enjoy, and I’m sure it’s worth every penny if even only one soul comes to see Jesus for who He is and repents, still what we give in coin could today be more wisely placed for the spread of the gospel. And you are so right what we do with our efforts beyond the coinage also needs to be prayerfully handled. Thanks for reminding us of our top priority. You are so right. Most of our time is spent on trivilous things in the Church instead of just simply winning souls for Christ. Even when we win them we don’t try hard enough to keep them. Thank you for your input. We need to be reminded of our purpose every now and again. This post moved me to pray for those who are not saved in my life; also for those I evangelized today in campus ministry. Amen and Hallelujah. Continue to do the work of the Lord and do not become weary in well doing. We serve a marvellous God. Thank you for that sister, God bless you!